BERLIN (AP) — Bayern Munich all but secured its unprecedented sixth consecutive Bundesliga title after routing Borussia Dortmund 6-0 on Saturday. Bayern can wrap up the title and extend its league titles record with a win at Bavarian rival Augsburg next Saturday. 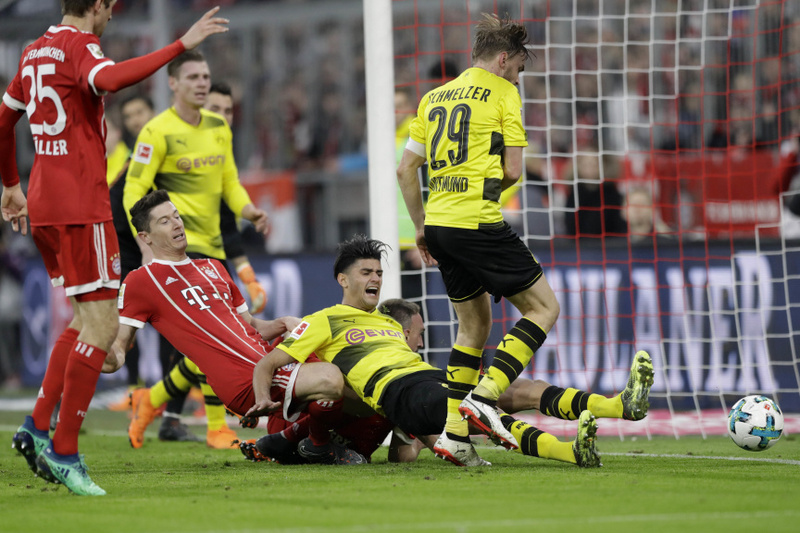 "Especially in the first half, we showed a gala performance," coach Jupp Heynckes said after Bayern inflicted Dortmund with its biggest league defeat in 27 years. "We played football with such ease and had a very good positional game. We made our playing and technical superiority count." Robert Lewandowski kicked off a hat trick against his former side in the fifth minute, after Thomas Mueller was left in plenty of space to play him through. Though the Poland striker looked offside, there was no intervention from the video referee. Franck Ribery's goal four minutes later was ruled out through VAR, after James Rodriguez got a touch to the ball. Again, it was a marginal call. But Bayern was tearing Dortmund apart and James scored the side's second in the 14th, again with a suspicion of offside. Dortmund midfielder Gonzalo Castro then lost the ball to James, who surged forward and floated in a perfect cross for Thomas Mueller to score. Peter Stoeger took off the unfortunate Castro for Julian Weigl shortly afterward but Bayern's dominance continued regardless. Lewandowski's boot-tip provided the fourth after good work from Ribery, who followed up two minutes later with Bayern's fifth before the break, again set up by James. The halftime scoreline was in no way flattering to Bayern. Manuel Akanji provided the only highlight for Dortmund with a last-ditch tackle on the otherwise-free Lewandowski, while Andre Schuerrle epitomized the visitors' game when his attempted pass went straight out of play. Mario Goetze struck the post with Dortmund's first real chance midway through the second half, but by then Bayern was already thinking of Tuesday's Champions League quarterfinal first leg at Sevilla. Heynckes took off the excellent James and Ribery to ovations with over 20 minutes remaining. Joshua Kimmich, who went on for David Alaba at the break, crossed for Lewandowski to complete his hat trick late, improving his league-leading tally to 26. Second-place Schalke beat Freiburg 2-0 to put Bayern's title celebrations on hold for at least another week. Schalke stayed 17 points behind the defending champion with six rounds remaining. Freiburg captain Nils Petersen was sent off after two yellow cards in quick succession. Freiburg coach Christian Streich had to be restrained from remonstrating with the ref as he too was sent off. Schalke stretched its winning run to six games. Hannover substitute Niclas Fuellkrug thought he'd scored twice in three minutes to claw back a two-goal deficit against visiting Leipzig. But his second goal was ruled out for offside after the video referee intervened. Leipzig held on to win 3-2 and move to fourth — the last qualification place for the Champions League — while Hannover slipped to its fifth consecutive loss. Bayer Leverkusen's 0-0 draw at home to Augsburg allowed Leipzig to move ahead by a point with six games remaining. Hamburger SV and Cologne needed wins to ease their relegation worries. Hamburg drew at Stuttgart 1-1 and Cologne was routed at Hoffenheim 6-0. Hamburg remained bottom, while Cologne remained five points below Mainz in the relegation playoff place. Wolfsburg was just a point above Mainz - which hosts Borussia Moenchengladbach on Sunday - after being held at Hertha Berlin to 0-0.